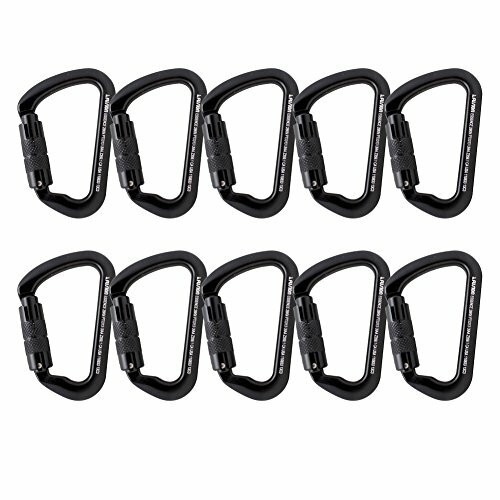 - Cold forged, modified D-shaped, aluminum carabiner with an auto-locking spring loaded gate and snag free key nose. - Featuring a modified D-shape and is perfect for all climbing and tactical uses. - Perfect for belaying and a variety of tactical and climbing because it is easy to use with one hand and locks as soon as it’s released. - This aluminum, auto-locking carabiner provides the maximum amount of safety and durability. - It has a snag-free key nose for faster clipping and unclipping, and features an auto-locking spring loaded gate. - Easy to use single-handedly. - H53Meets ANSI Z 359.1-92, UIAA standards.